One of the singular talents in landscape design, Chip Sullivan has shared his expertise through a seemingly unusual medium that, at second glance, makes perfect sense--the comic strip. 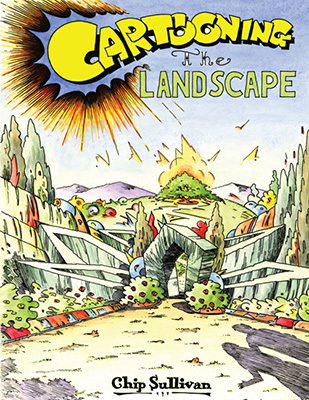 For years Sullivan entertained readers of Landscape Architecture Magazine with comic strips that ingeniously illustrated significant concepts and milestones in the creation of our landscapes. These strips gained a large following among architects and illustrators, and now those original works, as well as additional strips created just for this book, are collected in Cartooning the Landscape. Framed by a loose narrative in which a young man’s search for wisdom is fulfilled by a comics shop owner who instructs him not only in the essentials of illustrating but in how to see, the book takes us on a whirlwind series of journeys. We visit the living sculptures of the Tree Circus on California’s Highway 17, the vast network of tunnels and fortifications--almost an underground city--of France’s Maginot Line, and take a trip through time that reveals undeniable parallels between the Emperor Hadrian’s re-creation of the Elysian Fields and, of all things, the iconic theme parks of Walt Disney. Sullivan immerses us in the artist’s concepts and tools, from the Claude mirror and the camera obscura to the role of optical illusion in art. He shows us how hot air balloons introduced aerial perspective and reveals exhibition effects that portended everything from Cinerama to Smell-O-Vision. Sullivan’s book is also a plea, in an era increasingly dominated by digitally rendered images, for a new appreciation of the art of hand drawing. The proof of this craft’s value lies in the hundreds of Sullivan’s panels collected in this passionate, humorous, always illuminating tour of the rich landscape surrounding us.